Former teenage star Corey Feldman, who starred in some classic movies and became an 80’s Hollywood icon, admits he was preyed on by many men and he plans to reveal the names of two Hollywood perverts in a tell-all book. On film sets such as The Goonies, Stand By Me and The Lost Boys, Corey Feldman, 40, claims to have been sexually abused by paedophiles. The Dancing On Ice star explained how at age 14 he was being leached upon and used by men like vultures. The Canadian actor, who has been clean of drugs for 20 years, will write a book to chronicle all the abuse that he and other actors endured as children. Corey Feldman decided it was time to open up about the seedy side of the industry after his Lost Boys co-star Corey Haim, 38, died and an agent was charged with child abuse. He said that Corey Haim, who died from heart failure and pneumonia, was also sexually abused and the people who did it believe that they are above the law. 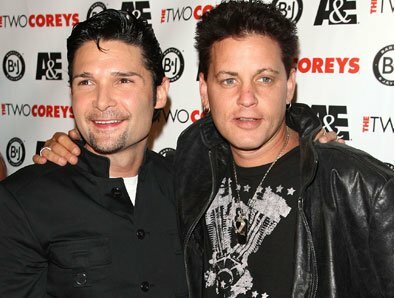 Corey Feldman feels Hollywood have used the pair as scapegoats and labeled them drug addicts and has-beens. He said: “Even today people say about me, <<Eighties heartthrob; hasn’t done anything since>>. The truth is I haven’t stopped. Last year I did four films. The actor first spoke out about his troubled past last year and he believes that is the reason why an anonymous former child actor claimed he had been abused by talent agent Martin Weiss. Although Martin Weiss, 47, did not abuse Corey Feldman, he is still helping the detective in charge of the case with investigations. Corey Feldman is aware of the danger he is putting himself and his family in by naming those who molested him but after losing his good friend Corey Haim he wants to protect his own son.